Baka’s been in the OVO world for a long time, and now it’s official. Having just announced the lineup for the eighth annual OVO Fest, Drake is adding a new name to the label's roster. Baka has been around the OVO crew for some time now, most recently performing "Gyalchester" with Drake in a fountain during the Billboard Music Awards. 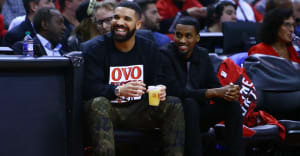 On Wednesday, the rapper posted a video to Instagram showing Drake announcing him as the latests signee to OVO. Drake had the contract ready to go in what looks like a crowded nightclub. Baka was released from jail back in 2015 after serving time for assault and human trafficking charges.